The ViziFrame Windows Client is included free of charge with every system. It allows you to easily manage one or hundreds of ViziFrames over a LAN, WAN, VPN, or Internet. You can use it to build playlists that combine stored local content and dynamic network based content all in a single presentation. The ViziFrame Client application runs on most Microsoft Windows based PCs, including Windows ME, 2000, 200 Server, XP Home and Pro, plus Vista and its multitude of flavors. 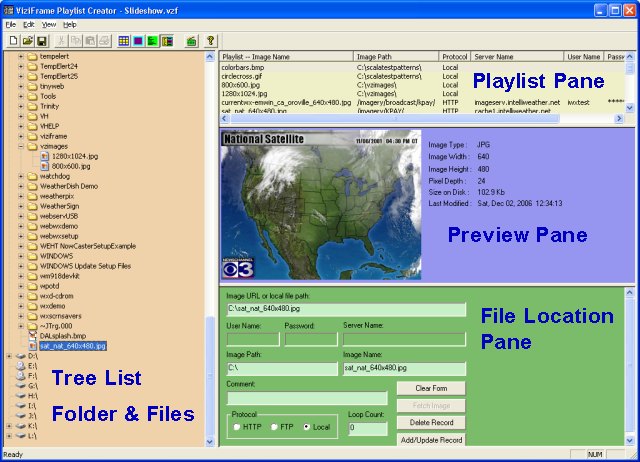 The application allows the user to create Static and Dynamic Playlists and transmit them to any number of ViziFrame Servers via FTP. The client application initially shows four panes in a single window, as shown below. The left pane is a tree view listing the current drives in the local machine. If a favorites folder has been set in your PC, then this tree list will display the contents of that folder, otherwise it will display the available drives. Note that you can change the size of the panes by dragging the borders if you wish. The right pane is split into three sub-panes. The top sub-pane displays the Play List. The list is displayed in ascending order. That is, the top item in the list is the first image that will be displayed in the slide show. The list consists of seven columns of data. The Image Name column contains the file name of the image to be displayed. The Image Path column displays where the file is located on the server. The Protocol column displays how the file will be retrieved from the server. The Server Name column displays the server name. The User Name column displays the authenticated user name for the server. The Password column displays a hidden password. The Loop Count column shows how many images are in the loop set. To add an item to the list, fill out the fields in the bottom pane and press the Add/Update button (see below). The item will be added to the list immediately below the current selection, or at the bottom of the list if no item is currently selected. To delete an item, highlight the item and press the Delete Record button in the bottom pane. The user will be prompted to confirm the deletion. To move an item or change the order of the items, select an item and press the Move Up or Move Down arrows in the toolbar, or by right-click on the item and select Move Up or Move Down from the context menu. The middle Preview Pane displays a thumbnail version of the currently selected image. The user may display images by selecting them in the tree control, or by highlighting an item in the play list. In the latter case, the image is only displayed if it has previously been retrieved from the server (see Fetch Image below). Some image data is also displayed. That data includes the image type (BMP, JPG, GIF, or PNG), the image width and height on screen, the pixel depth of the image, the size of the image file on the hard drive, and the date and time that the file was last modified. The bottom pane displays controls where the user may enter image data. or press the Publish button on the Toolbar. The program will display a communications dialog where the user enters the server name (if you established a DNS entry for the machine, such as viziframe1.mydomain.com) or IP address of the ViziFrame Server, and a user name and password to access the ViziFrame Server’s FTP service. The FTP service uses standard FTP on ports 20 and 21. If your firewall is set to block FTP transfers, it will need to be opened for these ports. The default factory supplied ViziFrame Server username and password will automatically fill in, all you need to do is supply the IP address where the ViziFrame exists on your network. If you have only one or more than one ViziFrame Server on your network, you can do a "Add Server" after you have typed in the connection and login details correctly for each server. You will then be able to select the server from the drop down list later to enable quicker publishing. When a successful connection is made to the ViziFrame Server, the program will transmit the play list and any local content to the appropriate directories on the ViziFrame Server. You will be able to see a message that says "All files transmitted successfully". Note: The ViziFrame Server may take up to 60 seconds to load the new show after it has been received from the ViziFrame client. It depends on when the new show was received in relation to the internal checking done by the ViziFrame Server. On some occasions your show may update almost immediately, at other times it may take longer. This is normal. The ViziFrame Client program ships with every ViziFrame Appliance on the included CD ROM. You can install it to any Windows ME, 2000, XP, or Vista based PC that has local network and/or Internet connectivity with the ViziFrame Appliance(s) you've set up. You can use the ViziFrame Client to publish a show to one or more ViziFrames, and you can also specify URL's where dynamic live content can be pulled from a web server into the ViziFrame Appliance automatically. Each ViziFrame Appliance checks the URL you specify every minute to see if the image has updated, if it has, a new image is downloaded and replaced in local memory. If not, nothing occurs. The bandwidth impact of this is very low, averaging about 80-120 bytes of data.